Swiss quality is evidenced in every facet of the Swiss Diamond 10.25 inch (26 cm) Fry Pan. 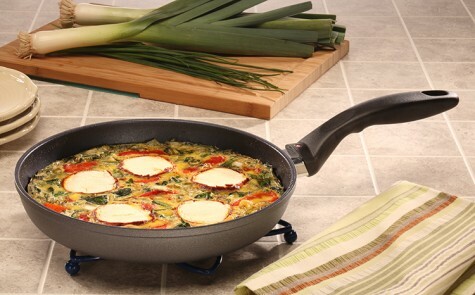 Unsurpassed nonstick performance allows cooking with little to no oil for a healthier lifestyle. No more scrubbing or soaking – the diamond-reinforced patented coating ensures immediate release of food particles with just warm soapy water.The rivet-free interior prevents unsightly food build-up that could lead to bacteria growth. Dishwasher safe but hand-washing recommended. Suitable for all gas and electric stovetops – for an induction version, please see our Induction Collection. Also available with a heat-tempered glass lid. — From the website. I’m a believer! I had to throw away two pans last week. Both “non-stick.” Both were horrible and cheap. One was a ceramic, the other your standard bonded on finish. I don’t like non-stick. They scratch, they have hot spots, I’m afraid to heat them up very much… Until now. Frustrated, I walked into Linens and Ladles in Carytown with the intention of buying an All-Clad frying pan (which I did!) and lo and behold, walked out with what the manager assured me was the pinnacle of scientifically achieved non-stick 10.25″ frying pans. It wasn’t cheap, but it was on sale. Come to think of it, since the pan is made up of diamond-infused composite and pressure-cast aluminum, it might be a bargain. What do diamond chips go for these days? Regardless, I’ll treat it with love and respect and it should be with me for a long time. The long and short of it is, this pan works! I haven’t had to heat it up beyond a medium setting on the gas cooktop and it browns like a champ. Dishes slide right out, clean up of the cooled pan is a breeze. And yes, you can finish a dish in the oven as long as you’re under something 500°F. I’m dying to make a Tortilla Española with this thing. Read all about it and invest if you need a new non-stick whatever. This entry was posted in Uncategorized and tagged All-Clad, Carytown, cooking, Linens and Ladles, non-stick cookware, Swissdiamond, Tortilla Espagñola. Bookmark the permalink. That sounds like a great find! Nothing is more annoying than a poor functioning frying pan. Loved your catchy title too! Now all we need are some more recipes that you recommend we cook in a non stick fry pan. Or just use a well-seasoned cast-iron pan. Class cooking is just as good as classic clothing! Tony, agree completely. I own two, which were my grandmother’s. Great pans. But very heavy.